The majority will remain in Greece as European asylum rules – the so-called Dublin Regulation – set out that asylum-seekers must apply for asylum in the country where they first arrive. Greece, as the country of first arrival bears the responsibility of assisting and protecting them, with only few exceptions. Family reunification is almost the only way people can move safely from Greece to another European country. However, it is severely restricted: asylum-seekers can only reunite with their nuclear family members – spouses, children, or in the case of unaccompanied minors, other relatives in other EU countries. For Golroz from Afghanistan, this means that she will have to leave her 65-year-old aunt Bibi behind in Greece. Golroz has been stranded in Greece since February 2016 with three of her four children, her husband, her aunt and a young niece. When Germany accepted her request to join her oldest son who lives there, in mid-2017, she felt huge relief. “I think of him every day”, she said. But her aunt Bibi would have to stay in Greece because only the direct family members and Golroz’ young niece had been accepted. Bibi is like a second mother to Golroz. 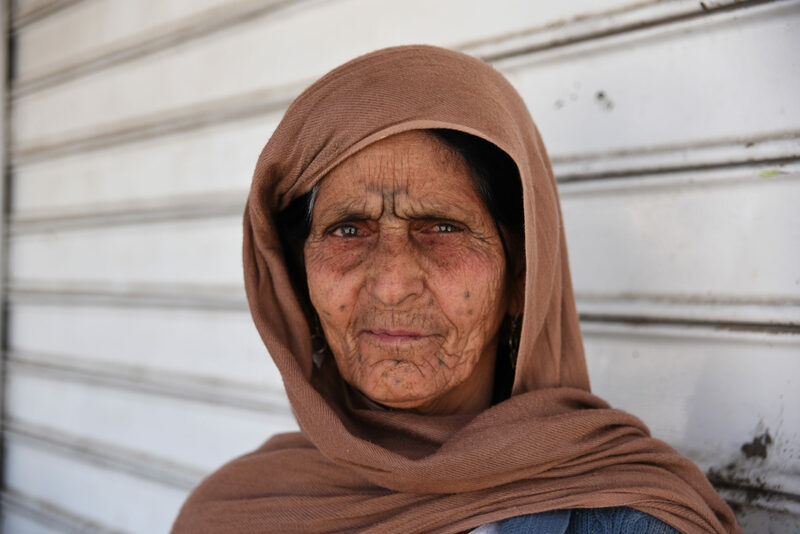 They lived together in Afghanistan after Bibi’s four sons were killed, and Golroz could not leave her behind when the family decided to embark on the perilous trip to Europe in search of safety. In Greece, they supported each other in the harsh conditions of the camps, including sleeping in a tent outside the terminal of the unused airport in Athens for several months. With the help of a lawyer from a Greek NGO, the decision has been appealed twice. The family appealed on the basis Bibi’s age, the strong family links, her dependency and her health: Bibi has been diagnosed with Hepatitis B, Osteoporosis, Otitis and has cataracts. But the appeals have been rejected. Amnesty met the family in Thiva and Elliniko camps in 2017 and in their flat in Athens in July 2018. In Athens they were attending German lessons, preparing to start a new life in Germany. She still cannot believe Bibi will not be travelling with them. Women travelling alone or with children account for most of the people waiting to be reunited with relatives in other countries. There are also families in Greece hoping to join their children who travelled alone to other European countries. Many have been stranded for over a year. Women recounted how the prolonged separation combined with little or no information on the process are impacting on their mental health, exacerbating their anxiety and depression. Moreover, the definition of “family” in EU law is restricted to members of the nuclear family. Exceptions to the definition, such as reunification on humanitarian or dependency grounds, are not always accepted. This means that, for instance, elderly women or women survivors of violence with extended family links in other countries are at serious risk of being left behind in Greece. Since 2016, European countries, mainly Germany, have received over 14,300 reunification requests and around 12,500 have been accepted. Reunions have happened in around 9,200 cases. But Golroz and Bibi are not a statistic. They are two of the more than 100 uprooted women in Greece that Amnesty has spoken to since March 2017. These women and girls had crucial things to say about their rights, safety, wellbeing and the challenges ahead. On the basis of these conversations, Amnesty put together their ten clear demands for change, aimed at the authorities in Greece and Europe. These include a call on European leaders to expand family reunification options and reach an agreement on a fairer system to accept refugees reaching Europe’s shores.